The province’s original Khmer name was Srok Kh’leang, meaning “silver depository” because it was where the Khmer king’s silver treasury was located. The Vietnamese settlers corrupted it into “Sốc-Kha-Lang” and eventually “Sóc Trăng”. Under the Nguyễn Dynasty emperor Minh Mạng, it was given the Sino-Vietnamese name Nguyệt Giang or Moon River. Coming to Soc Trang, you will not only have the chance to admire the beauty of Khmer temples, Vietnamese temple, or Chinese temples, but also many historic and tourists destinations and most importantly, the wonderful world of culinary of the region. 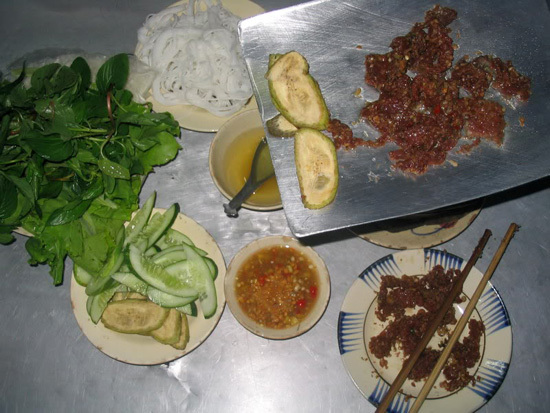 One of Soc Trang best cuisine, the name of the meal was originally came from the method of making it. From the early days, people used to use a ying-yang roof tiles made out of soil. Nowadays, they use a thick piece of stainless steel in which looks like a shovel to cook the beef. In order to make the dish, the beef has to be the finest, washed, dried, sliced to thin pieces, and then spiced with salt, sugar, some peanuts. Either the beef is cooked on the tiles or the shovel, but both produce an equally delicious dish. The beef needs only a few minutes to ready. Eaten along with some fresh noodle, star fruit, pineapple, bitter banana, herbs, lettuce, the beef requires one more special ingredient, the sauce. When cooking, the chef will put tiles or the shovel on top of the oven while on the other side; he or she will have a bowl to remove the grease. The grease will be used to cool down the hot tiles or shovel. Using chopsticks to turn the beef for a several times and you will a delicious meal. You can use rice paper and beef with the extensive list of herbs to make a delicious roll for yourself. Dipping the roll into the flavorful pineapple fish sauce, you will experience the sweetness of the beef, the fat of the peanut, the bitter of the raw banana, the sour of the star fruit, the pineapple, and the spicy of the chili. Coming to Nga Nam, Soc Trang, you should definitely visit the delicious fried snakehead distillated with soybeans in which is exclusively made by the locals. The dish is a mixture of ingredients from the region only. The snakehead is from the paddy fields of Soc Trang, handmade by the locals and is distillated meticulously with soybeans. From this, the fish can be cooked with anything. The fish can be boiled and eaten along with lemon, garlic, chili, and other spices. Or the fish can be served with bacon. However, the best is the fried distillated snakehead. The fried snakehead is easy to make but it is not easy to perfect it. First of all, a bit of minced garlic and oil will be put into the pan to create the smell. Keep the fire small and let the fish into the frying pan. Cover the pan and let the ingredients absorbed by the fish. The perfect fried snakehead is dried from oil, solid, and the color is a little bit red. The snakehead can be eaten with raw banana, pineapple, cucumber, herbs, and with rice. The mixture of flavors is just irresistible. 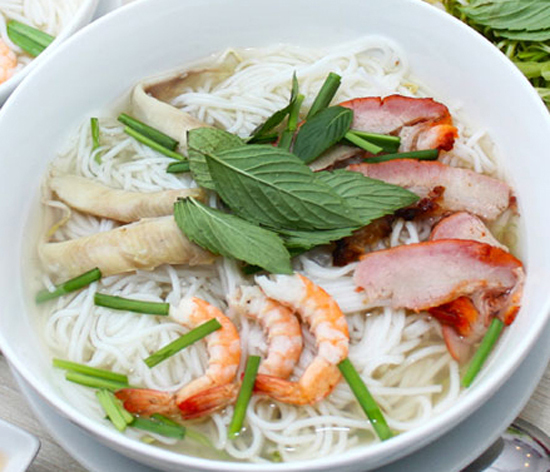 The soup noodle is famous for its graceful combination of the ingredients. 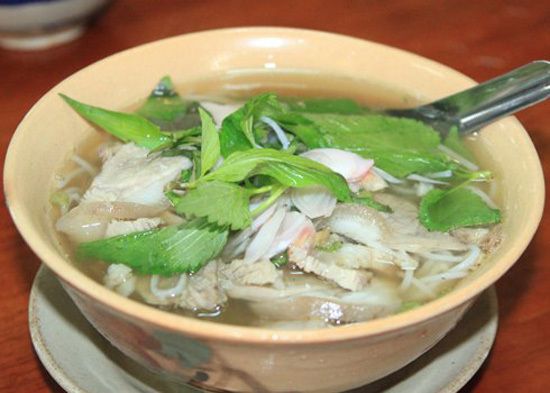 The soup noodle is wonderful, and distinguishes from many other noodles thanks to its one and only broth. The only people who can make this dish are those who come from this land. The feature is the crystal clear broth. It also takes a lot of effort to produce such high quality broth. First of all, the chef will put in some snails, add in some water, and boil for a long period of time. He or she would have to remove the foam periodically. Take only the meat of the fish after washed and steamed it. The bone is useful for making the broth. The broth has the smell of the fish and other ingredients as well. When eating, you should remember to steam the noodle first, and then put the noodle underneath other things like shrimps, meat, and herbs. Then cover everything with the broth. Herbs are essential to this dish. The long list of herbs consists of bean sprouts, shallot, basil, lemon, and a bit of salt, and pepper. The dish is salty, sweet, sour and fat at the same time. For every bite, you will understand more about this land, and about its people. Originally served like rolls with so many ingredients like shrimps, noodle, herbs, the dish was modified by the locals. By putting everything into a bowl and mixing and dipping into the sauce, the locals create a dish called Goi da noodle. The word “và” (means pouring in) was corruptly pronounced “dà.” The dish is called since then. To make the dish, first of all, the bean sprout and the noodle have to be steamed in the broth. After that, the noodle and the sprout are placed underneath the meat, and then the broth is poured in until it covers everything. The dish is eaten along with herbs. It may sounds simple, yet the difference comes from the wonderful shrimps, the sweet broth, and the sour of tamarind. The dish is red because of the shrimps, sweet because of the ribs, the sliced bacon and incredibly flavorful because of the herbs. Adding in some peanut to increase the fat of the dish, you will have to come back for more. Pepper pork noodle is simple yet elegant. The Soc Trang best cuisine consists of noodle pepper, and pork. The broth is sweet thanks to the bone; the pork is bold because of the pepper, rich and hot at the same time. The pork chop is the main ingredient of this dish. The pork is cut into smaller pieces, shaved and stewed. The pork is sliced, but not too thick to make the dish less elegant. Other than pork, people also use duck to eat with. The dish is eaten along with bean sprout, basil, oregano, sliced red onion. 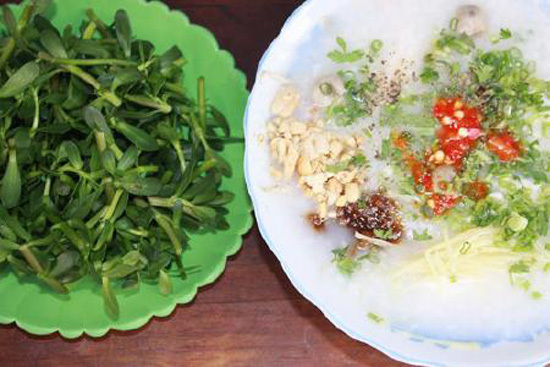 From rice, snakehead, endive, and the artful skills of the Soc Trang people, the porridge is truly the ultimate art of the Southern land. The snakehead is washed, steamed. After that the bones are removed. The fish meat is white and is served along with many other ingredients. The fish is dropped into the hot pot of porridge. After that, the chef adds in some endive leaves, lemon and a bit of fish sauce. The bowl of porridge consists of the fish meat, a bit of mushroom, sauce, sprouts, pepper, cilantro, herbs, ginger, chili and lemon. Fish sauce can also be used with the porridge as well. Tasting the wonderful bowl of porridge, experiencing the spicy of chili, the sweet of the fish, the bitter of the endive, and you will know how to be a Western-er. Soc Trang has many unique dishes that are nowhere to be found. One of those dishes is the famous fish noodle. One feature of the noodle is the broth, which is sweet thanks to the long period of stewing the pork bones. To make the broth clear, it is imperative not to let any oil or grease in. 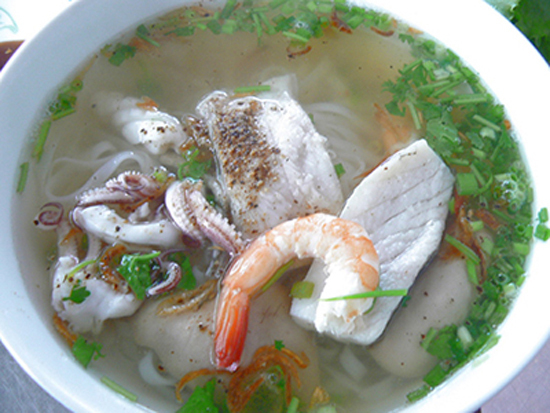 The fish noodle uses much type of fish, only use the fillet and other seafood such as shrimps, squid. 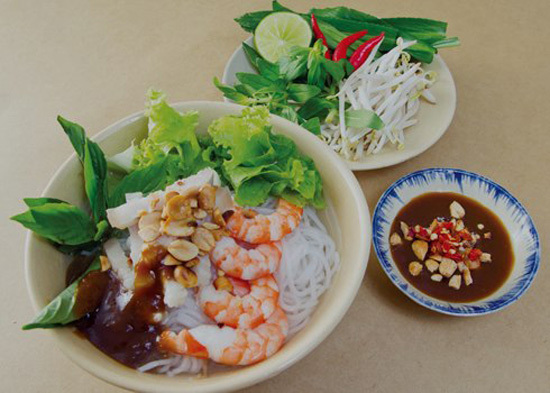 The fish noodle is sweet, and very delicious where on top are the fillet, shrimp, squid, with some herbs such as salad, bean sprouts,. The beautiful bowl of fish noodle, with its crystal clear broth, can mesmerize any food lover who comes to enjoy this wonderful dish. The fish is sweet and fat, the squid is tough, the shrimp is also sweet, the noodle is thin and elegant that will make you come back for many more rounds. 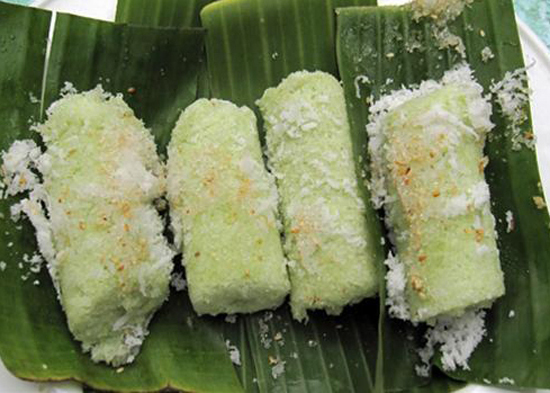 Tube cake is made of rice flour, mixed with pineapple leaves, sugar, and coconut milk. The cake is baked in bamboo tube or aluminum tube, so people call it tube cake. The best time to eat the cake is when it is still hot. The cake has emerald green comes from the pineapple leaves, and is sweet and fat like sugar and coconut milk. You can add in some sesame to make flavor even more wonderful. The cake, thanks to the rice flour, is soft and easy to eat, combines with some amazing flavors from so many ingredients will make you never forget. A creation of Trieu Chau people, the cake is a symphony of many similar ingredients that can be found anywhere in the Mekong. It is the icon of the Soc Trang culinary. Pia is a word in Trieu Chau’s language, which means cake. 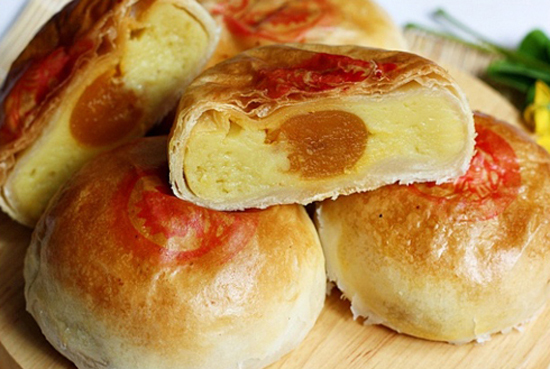 Gradually throughout time, others consider the name as round-shaped and flat cake that is incredibly good. The cake has the crust made from flour and sugar, while the choices for the inside are endless. From durian, taro, pea, and with the amazing salty duck egg yolks, and all kind of jams. Combined gracefully from many ingredients, the Pia cake of Soc Trang brings to the diners many wonderful feelings: the soft of the crust, the salty and a bit fat of the yolks. You can eat so many cakes without stop eating. Many come to Soc Trang just to have the taste of this cake. Cong is a special type of cake of the Khmer people in Soc Trang. 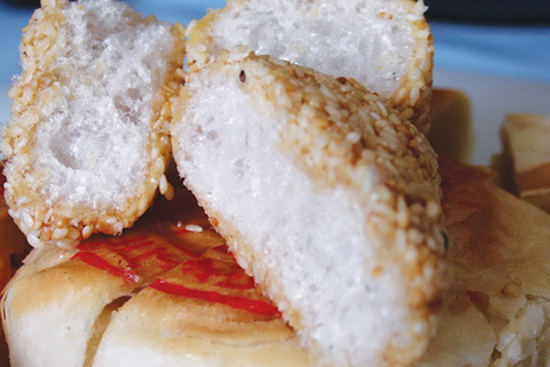 Cóng or cống or say or sai is what people call this cake. The crust is made of rice flour, soybean and eggs while the inside is made of pork with some spices, minced red onions, and some steamed smashed pea. Each cake has a yellow color combines with the red from the shrimps makes the cake so beautiful. The cake is eaten with some herbs such as mint, cinnamon, lettuce, broccoli and the one and only fish sauce with some slices of ginger pickles, and chili. 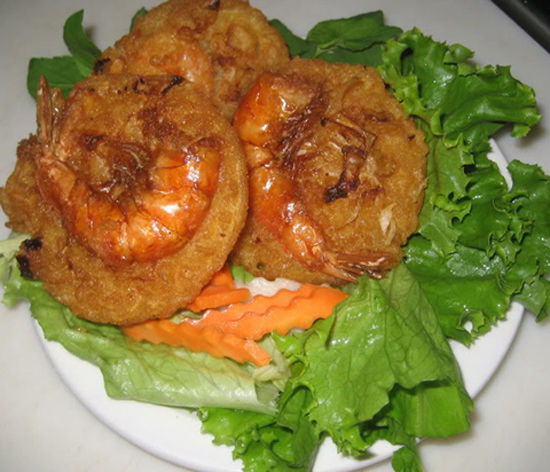 The deep fried hot cake is taken out of the pan, sliced into many smaller, bit-size pieces, wrapped with lettuce, salad, and herbs, dipped in the fish sauce and into your mouth will create a amazing experience that you will want more. The fat of the pork, the sweet of the shrimp, the sour of the sauce, all combine to create this wonderful dish. 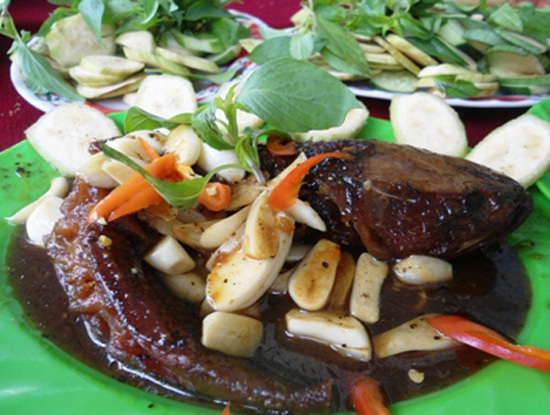 Me lao is a special Chinese dish in Soc Trang. The cake is crunchy, with some sesame on top and will melt in your mouth as soon as the sugar layer outside does the same. The dish is made of taro. After peeled the taro, the chef will smashed it, then turn the smashed taro into smaller cake, and then dried for 3 days. Cutting the taro into rectangular pieces, putting on some flour coat and throwing them in the frying pan and you will have a delicious cake. But it is not finished. After frying the cake, make sure you roll it on the caramel like sugar and some sesame too. The cake is crunchy from the outside, but the inside is soft and sweet. Eating Me lao, you will feel the softness of the cake, the sweetness of the sugar, and the fat of the sesame with the crunchy of the crust. All are combined to create a unique cake. The sausage of Soc Trang is loved by many people. Making sausage is a tradition of the Chineses people in Soc Trang. There are many kinds of sausages like the fresh sausage, lean sausage or even shrimp sausage. Sausage, in Mandarin is “Lap Xeng.” Although there are many types of sausages, the main ingredient is the fresh sausage, which has the portion of 50-50 for the lean and fat. After chopped and grinded, mixed with some spices, all of the ingredients are poured into pork small intestines, tied on two ends, and dried for 3 days. With the special recipe, and many flavors, the Soc Trang sausage is different from others places sausage. 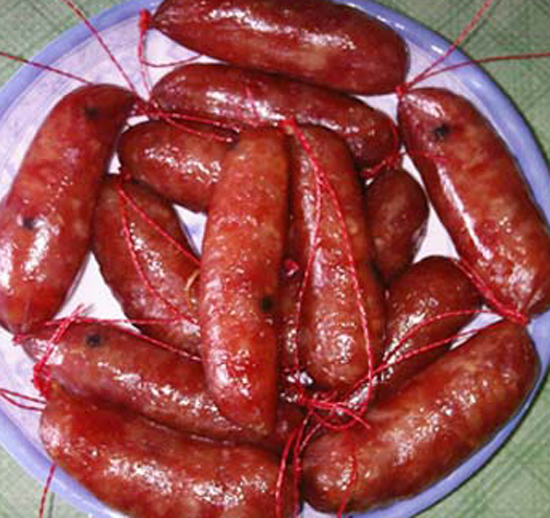 The Soc Trang sausage is well known not only to the domestic market, but also abroad.